Luc Clément, Active Endpoints, Inc.
Michael Rowley, Active Endpoints, Inc. Web Services Business Process Execution Language, version 2.0 (WS-BPEL 2.0 or BPEL for brevity) introduces a model for business processes based on Web services. A BPEL process orchestrates interactions among different Web services. The language encompasses features needed to describe complex control flows, including error handling and compensation behavior. In practice, however many business process scenarios require human interactions. A process definition should incorporate people as another type of participants, because humans may also take part in business processes and can influence the process execution. This specification introduces a BPEL extension to address human interactions in BPEL as a first-class citizen. It defines a new type of basic activity which uses human tasks as an implementation, and allows specifying tasks local to a process or use tasks defined outside of the process definition. This extension is based on the WS-HumanTask specification. This document was last revised or approved by the OASIS WS-BPEL Extension for People Technical Committee on the above date. The level of approval is also listed above. Check the “Latest Version” or “Latest Approved Version” location noted above for possible later revisions of this document. Technical Committee members should send comments on this specification to the Technical Committee’s email list. Others should send comments to the Technical Committee by using the “Send A Comment” button on the Technical Committee’s web page at http://www.oasis-open.org/committees/bpel4people/. For information on whether any patents have been disclosed that may be essential to implementing this specification, and any offers of patent licensing terms, please refer to the Intellectual Property Rights section of the Technical Committee web page (http://www.oasis-open.org/committees/bpel4people/ipr.php). The non-normative errata page for this specification is located at http://www.oasis-open.org/committees/bpel4people/. Copyright © OASIS® 2010. All Rights Reserved. This specification introduces an extension to BPEL in order to support a broad range of scenarios that involve people within business processes. The BPEL specification focuses on business processes the activities of which are assumed to be interactions with Web services, without any further prerequisite behavior. But the spectrum of activities that make up general purpose business processes is much broader. People often participate in the execution of business processes introducing new aspects such as interaction between the process and user interface, and taking into account human behavior. This specification introduces a set of elements which extend the standard BPEL elements and enable the modeling of human interactions, which may range from simple approvals to complex scenarios such as separation of duties, and interactions involving ad-hoc data. The specification introduces the people activity as a new type of basic activity which enables the specification of human interaction in processes in a more direct way. The implementation of a people activity could be an inline task or a standalone human task defined in the WS-HumanTask specification [WS-HumanTask]. The syntax and state diagram of the people activity and the coordination protocol that allows interacting with human tasks in a more integrated way is described. The specification also introduces XPath extension functions needed to access the process context. Portability - The ability to take design-time artifacts created in one vendor's environment and use them in another vendor's environment. Interoperability - The capability for multiple components (process infrastructure, task infrastructures and task list clients) to interact using well-defined messages and protocols. This enables combining components from different vendors allowing seamless execution. Out of scope of this specification is how processes with human interactions are deployed or monitored. Usually people assignment is accomplished by performing queries on a people directory which has a certain organizational model. The mechanism of how an implementation evaluates people assignments, as well as the structure of the data in the people directory is also out of scope. There are no non-normative references made by this specification. A BPEL4People Definition is a WS-BPEL 2.0 process definition that uses the BPEL4People extensions to WS-BPEL 2.0 specified in this document. A BPEL4People Processor is any implementation that accepts a BPEL4People definition and executes the semantics defined in this document. A WS-HumanTask Definition is any artifact that complies with the human interaction schema and additional constraints as defined by the WS-HumanTask 1.1 specification. A WS-HumanTask Processor is any implementation that accepts a WS-HumanTask definition and executes the semantics as defined by the WS-HumanTask 1.1 specification. The BPEL4People extension is defined in a way that it is layered on top of BPEL so that its features can be composed with BPEL features whenever needed. All elements and attributes introduced in this extension are made available to both BPEL executable processes and abstract processes. This extension introduces a set of elements and attributes to cover different complex human interaction patterns, such as separation of duties, which are not defined as first-class elements. Throughout this specification, WSDL and schema elements may be used for illustrative or convenience purposes. However, in a situation where those elements or other text within this document contradict the separate BPEL4People, WS-HumanTask, WSDL or schema files, it is those files that have precedence and not this document. WS-BPEL 2.0: BPEL4People extends the WS-BPEL 2.0 process model and uses existing WS-BPEL 2.0 capabilities, such as those for data manipulation. WS-HumanTask 1.1: BPEL4People uses the definition of human tasks and, notifications, and extends generic human roles and people assignments introduced in WS-HumanTask 1.1. WSDL 1.1: BPEL4People uses WSDL for service interface definitions. XML Schema 1.0: BPEL4People utilizes XML Schema data model. XPath 1.0: BPEL4People uses XPath as default query and expression language. Extension attributes and extension elements MUST NOT contradict the semantics of any attribute or element from the BPEL4People namespace. The standard BPEL element <extension> MUST be used to declare mandatory and optional extensions of BPEL4People. This section explains the structure of BPEL4People extension elements, including the new activity type people activity, inline human tasks and people assignments. Informal syntax of a BPEL process and scope containing logical people groups, inline human tasks, and people activity follows. A BPEL4People Definition MUST use BPEL4People extension elements and elements from WS-HumanTask namespace. Therefore elements from namespaces BPEL4People and WS-HumanTask MUST be understood. The element <b4p:humanInteractions> is optional and contains declarations of elements from WS-HumanTask namespace, that is <htd:logicalPeopleGroups>, <htd:tasks> and <htd:notifications>. The element <htd:logicalPeopleGroup> specifies a logical people group used in an inline human task or a people activity. The name attribute specifies the name of the logical people group. The name MUST be unique among the names of all logical people groups defined within the <b4p:humanInteractions> element. The <htd:task> element is used to provide the definition of an inline human task. The syntax and semantics of the element are provided in the WS-HumanTask specification. The name attribute specifies the name of the task. The name MUST be unique among the names of all tasks defined within the <htd:tasks> element. The <htd:notification> element is used to provide the definition of an inline notification. The syntax and semantics of the element are provided in the WS-HumanTask specification. The name attribute specifies the name of the notification. The name MUST be unique among the names of all notifications defined within the <htd:notifications> element. The element <b4p:peopleAssignments> is used to assign people to process-related generic human roles. This element is optional. The syntax and semantics are introduced in section 3.1 “Generic Human Roles”. New activity type <b4p:peopleActivity> is used to model human interactions within BPEL processes. The new activity is included in the BPEL activity <bpel:extensionActivity> which is used as wrapper. The syntax and semantics of the people activity are introduced in section 4 “People Activity”. Any scope (or the process itself) can specify @b4p:shareComments="true" to specify that the comments that are added to any task executed within the scope (or a child scope) should be propagated to any other task within the same scope that is started after the first task completes. When comments propagate to later tasks, all metadata for the comment MUST also be propagated. Note that, when a scope specifies the sharing of comments, it is not possible to override that sharing for child or descendent scopes. When a scope specifies @b4p:shareComments="true" then child and descendent scopes MUST NOT specify @b4p:shareComments="false". However, an individual people activity can prevent its tasks’ comments from being propagated by specifying @dontShareComments="true". BPEL scopes can also include elements from BPEL4People and WS-HumanTask namespaces except for the <b4p:peopleAssignments> element. Note that XPath 1.0 explicitly requires that any element or attribute used in an XPath expression that does not have a namespace prefix must be treated as being namespace unqualified. As a result, even if there is a default namespace defined on the enclosing element, the default namespace will not be applied. Many of the concepts in BPEL4People are inherited from the WS-HumanTask specification so familiarity with this specification is assumed. Process initiator is the person associated with triggering the process instance at its creation time. The initiator is typically determined by the infrastructure automatically. This can be overridden by specifying a people assignment for process initiator. A BPEL4People Definition MAY define assignment for this generic human role. A compliant BPEL4People Processor MUST ensure that at runtime at least one person is associated with this role. Process stakeholders are people who can influence the progress of a process instance, for example, by adding ad-hoc attachments, forwarding a task, or simply observing the progress of the process instance. The scope of a process stakeholder is broader than the actual BPEL4People specification outlines. The process stakeholder is associated with a process instance. If no process stakeholders are specified, the process initiator becomes the process stakeholder. A BPEL4People Definition MAY define assignment for this generic human role. A compliant BPEL4People Processor MUST ensure that at runtime at least one person is associated with this role. Business administrators are people allowed to perform administrative actions on the business process, such as resolving missed deadlines. A business administrator, in contrast to a process stakeholder, has an interest in all process instances of a particular process type, and not just one. If no business administrators are specified, the process stakeholders become the business administrators. A BPEL4People Definition MAY define assignment for this generic human role. A compliant BPEL4People Processor MUST ensure that at runtime at least one person is associated with this role. The genericHumanRole abstract element introduced in the WS-HumanTask specification is extended with the following process-related human roles. Only process-related human roles MUST be used within the <b4p:peopleAssignments> element. People are assigned to these roles as described in section 3.2 (“Assigning People”). Assigning people to process-related generic human roles happens after BPEL process initialization (see [WS-BPEL 2.0], section 12.1). A BPEL4People Processor MUST initialize process-related generic human roles after the end of the initial start activity of the process and before processing other activities or links leaving the start activity. If that initialization fails then the fault b4p:initializationFailure MUST be thrown by a BPEL4People Processor. When specifying people assignments then the data type htt:tOrganizationalEntity defined in [WS-HumanTask] is used. Using htt:tOrganizationalEntity allows to assign either a list of users or a list of unresolved groups of people (“work queues”). This section focuses on describing aspects of logical people groups that are specific to business processes. Logical people groups define which person or set of people can interact with a human task or a notification of a people activity. Details about how logical people groups are used with human tasks and notifications are provided by the WS-HumanTask specification. Logical people groups can be specified as part of the business process definition. They can be defined either at the process level or on enclosed scopes. Definitions on inner scopes override definitions on outer scopes or the process respectively. Logical people group definitions can be referenced by multiple people activities. Each logical people group is bound to a people query during deployment. In the same way as in WS-HumanTask, a logical people group has one instance per set of unique arguments. Whenever a logical people group is referenced for the first time with a given set of unique arguments, a new instance MUST be created by the BPEL4People Processor. To achieve that, the logical people group MUST be evaluated / resolved for this set of arguments. Whenever a logical people group is referenced for which an in-stance already exists (i.e., it has already referenced before with the same set of arguments), the logical people group MAY be re-evaluated / re-resolved. In particular, for a logical people group with no parameters, there is a single instance, which MUST be evaluated / resolved when the logical people group is first referenced, and which MAY be re-evaluated / re-resolved when referenced again. Hence, using the same logical people group does not necessarily mean that the result of a people query is re-used, but that the same query is used to obtain a result. If the result of a previous people query needs to be re-used, then this result needs to be referenced explicitly from the process context. Please refer to section 5 “XPath Extension Functions” for a description of the syntax. A BPEL4People Definition MAY use the <assign> activity (see [WS-BPEL 2.0] section 8.4 for more details) to manipulate values of logical people group. A mechanism to assign to a logical people group or to assign from a logical people group using BPEL copy assignments is provided. The semantics of the <copy> activity introduced in [WS-BPEL 2.0] (see sections 8.4.1, 8.4.2 and 8.4.3 for more details) applies. In this form of from-spec and to-spec the b4p:logicalPeopleGroup attribute provides the name of a logical people group. The from-spec variant MAY include zero or more <b4p:argument> elements in order to pass values used in the people query. The expressionLanguage attribute specifies the language used in the expression. The attribute is optional. If not specified, the default language as inherited from the closest enclosing element that specifies the attribute is used. Using a logical people group in the from-spec causes the evaluation of the logical people group. Logical people groups return data of type htt:tOrganizationalEntity. This data can be manipulated and assigned to other process variables using standard BPEL to-spec variable variants. Using a logical people group in the to-spec of a <bpel:copy> assignment enables a set of people to be explicitly assigned. Whenever the logical people group is used after the assignment this assigned set of people is returned. Assigning values to a logical people group overrides what has been defined during deployment. This is true irrespective of any parameters specified for the logical people group. Below are several examples illustrating the usage of logical people groups in copy assignments. The first example shows assigning the results of the evaluation of a logical people group to a process variable. The next example demonstrates assigning a set of people to a logical people group using literal values. The third example shows assigning the results of one logical people group to another logical people group. The from-spec variant <bpel:from variable> is used to assign people that have been specified using a variable of the business process. The data type of the variable MUST be of type htt:tOrganizationalEntity. with XPath extension functions defined in section 5 “XPath Extension Functions”. The expressionLanguage attribute specifies the language used in the expression. The attribute is optional. If not specified, the default language as inherited from the closest enclosing element that specifies the attribute is used. Processes can have ad-hoc attachments. It is possible to exchange ad-hoc attachments between people activities of a process by propagating ad-hoc attachments to and from the process level. When a people activity is activated, attachments from earlier tasks and from the process can be propagated to its implementing human task. On completion of the human task, its ad-hoc attachments can be propagated to the process level, to make them globally available. All manipulations of ad-hoc attachments at the process level are instantaneous, and not subject to compensation or isolation. People activity is a basic activity used to integrate human interactions within BPEL processes. The following figure illustrates different ways in which human interactions (including human tasks and notifications) could be integrated. Constellations 1 and 2 show models of interaction in which tasks are defined inline as part of a BPEL process. An inline task can be defined as part of a people activity (constellation 1). In this case, the use of the task is limited to the people activity encompassing it. Alternatively, a task can be defined as a top-level construct of the BPEL process or scope (constellation 2). In this case, the same task can be used within multiple people activities, which is significant from a reuse perspective. BPEL4People processes that use tasks in this way are portable among BPEL engines that implement BPEL4People. This also holds true for notifications. Constellation 3 shows the use of a standalone task within the same environment, without the specification of a callable Web services interface on the task. Thus the task invocation is implementation-specific. This constellation is similar to constellation 2, except that the definition of the task is done independently of any process. As a result, the task has no direct access to process context. This also holds true for notifications. Constellation 4 shows the use of a standalone task from a different environment. The major difference when compared to constellation 3 is that the task has a Web services callable interface, which is invoked using Web services protocols. In addition, the WS-HumanTask coordination protocol is used to communicate between processes and tasks (see section 6 “Coordinating Standalone Human Tasks” for more details on the WS-HumanTask coordination protocol). Using this mechanism, state changes are propagated between task and process activity, and the process can perform life cycle operations on the task, such as terminating it. BPEL4People processes that use tasks in this way are portable across different BPEL engines that implement BPEL4People. They are interoperable, assuming that both the process infrastructures and the task infrastructures implement the coordination protocol. In case of notifications a simplified protocol is used. For more detail on the relationship of WS-HumanTask and the BPEL4People specifications refer to section 1.1 of WS-HumanTask. inputVariable: This attribute refers to a process variable which is used as input of the WSDL operation of a task or notification. The process variable in the BPEL4People Definition MUST have a WSDL message type. This attribute is optional. If this attribute is not present the <bpel:toParts> element MUST be used. outputVariable: This attribute refers to a process variable which is used as output of the WSDL operation of a task. The process variable in the BPEL4People Definition MUST have a WSDL message type. This attribute is optional. If the people activity uses a human task and this attribute is not present the <bpel:fromParts> element MUST be used. The outputVariable attribute MUST NOT be used if the people activity uses a notification. isSkipable: This attribute indicates whether the task associated with the activity can be skipped at runtime or not. This is propagated to the task level. This attribute is optional. The default for this attribute is “no”. dontShareComments: This attribute, if set to “true”, indicates that comments that are added to the task associated with this people activity MUST NOT be propagated to any other task. standard-attributes: The activity makes available all BPEL’s standard attributes. standard-elements: The activity makes available all BPEL’s standard elements. htd:task: This element is used to define an inline task within the people activity (constellation 1 in the figure above). This element is optional. Its syntax and semantics are introduced in section 4.3 “People Activities Using Local Human Tasks”. b4p:remoteTask: This element is used to refer to a standalone task offering callable Web service interface (constellation 4). This element is optional. Its syntax and semantics are introduced in section 4.5 “People Activities Using Remote Human Tasks”. htd:notification: This element is used to define an inline notification within the people activity (constellation 1 in the figure above). This element is optional. Its semantics is introduced in section 4.4 “People Activities Using Local Notifications”. b4p:localNotification: This element is used to refer to a standalone notification with no callable Web service interface (constellations 2 or 3). This element is optional. Its semantics is introduced in section 4.4 “People Activities Using Local Notifications”. b4p:remoteNotification: This element is used to refer to a standalone notification offering callable Web service interface (constellation 4). This element is optional. Its syntax and semantics are introduced in section 4.6 “People Activities Using Remote Notifications”. b4p:scheduledActions: This element specifies when the task changes its state. Its syntax and semantics are introduced in section 4.7 “Elements for Scheduled Actions”. bpel:toParts: This element is used to explicitly create multi-part WSDL message from multiple BPEL variables. The element is optional. Its syntax and semantics are introduced in the WS-BPEL 2.0 specification, section 10.3.1. The <bpel:toParts> element and the inputVariable attribute are mutually exclusive. bpel:fromParts: This element is used to assign values to multiple BPEL variables from an incoming multi-part WSDL message. The element is optional. Its syntax and semantics are introduced in the WS-BPEL 2.0 specification, section 10.3.1. The <bpel:fromParts> element and the outputVariable attribute are mutually exclusive. This element MUST NOT be used in a BPEL4People Definition if the people activity uses a notification. b4p:attachmentPropagation: This element is used to describe the propagation behavior of ad-hoc attachments to and from the people activity. On activation of the people activity, either all ad-hoc attachments from the process are propagated to the people activity, so they become available to the corresponding task, or none. The fromProcess attribute is used to specify this. On completion of a people activity, all ad-hoc attachments are propagated to its process, or only newly created ones (but not those that were modified), or none. The toProcess attribute is used to specify this. The element is optional. The default value for this element is that all attachments are propagated from the process to the people activity and only new attachments are propagated back to the process. Certain properties of human tasks and notifications can be specified on the process level as well as on local and remote task definitions and notification definitions allowing the process to override the original human task and notification definitions respectively. This increases the potential for reuse of tasks and notifications. Overriding takes place upon invocation of the Web service implemented by the human task (or notification) via the advanced interaction protocol implemented by both the process and the task (or notification). People assignments can be specified on remote and local human tasks and notifications. As a consequence, the invoked task receives the results of people queries performed by the business process on a per generic human role base. The result will be of type tOrganizationalEntity. The result needs to be understandable in the context of the task, i.e., the user identifiers and groups need to a) follow the same scheme and b) there exists a 1:1 relationship between the user identifiers and users. If a generic human role is specified on both the business process and the task it calls then the people assignment as determined by the process overrides what is specified on the task. In other words, the generic human roles defined at the task level provide the default. The same applies to people assignments on remote and local notifications. The task’s originator is set to the process stakeholder. Priority of tasks and notifications can be specified on remote and local human tasks and notifications. If specified, it overrides the original priority of the human task (or notification). A standalone task identified using a QName. In this case the task can be reused across multiple BPEL4People processes within the same environment. The syntax and semantics of people activity using local tasks is given below. Element <htd:task> is used to define an inline task within the people activity. The syntax and semantics of the element are given in the WS-HumanTask specification. In addition, XPath expressions used in enclosed elements MAY refer to process variables. Enclosed elements MUST use the current value of the process variable. Changes to process variables MUST NOT directly cause changes in the execution of the enclosed elements, but only provide more current values when the enclosed elements choose to re-evaluate the expressions. Element <b4p:localTask> is used to refer to a task enclosed in the BPEL4People process (a BPEL scope or the process scope) or a standalone task provided by the same environment. Attribute reference provides the QName of the task. The attribute is mandatory. The element MAY contain standard overriding elements explained in section 4.2 “Standard Overriding Elements”. The following code shows a people activity declaring an inline task. within 2 days after having been activated. The following code shows a people activity referring to an inline task defined in the BPEL4People process. A standalone notification identified using a QName. In this case the notification can be reused across multiple BPEL4People processes within the same environment. The syntax and semantics of people activity using local notifications is given below. Element <htd:notification> is used to define an inline notification within the people activity. The syntax and semantics of the element are given in the WS-HumanTask specification. In addition, XPath expressions used in enclosed elements MAY refer to process variables. Enclosed elements MUST use the current value of the process variable. Changes to process variables MUST NOT directly cause changes in the execution of the enclosed elements, but only provide more current values when the enclosed elements choose to re-evaluate the expressions. Element <b4p:localNotification> is used to refer to a notification enclosed in the BPEL4People Definition (a BPEL scope or the process scope) or a standalone notification provided by the same environment. Attribute reference provides the QName of the notification. The attribute is mandatory. The element MAY contain standard overriding elements explained in section 4.2 “Standard Overriding Elements”. The following code shows a people activity using a standalone notification. People activities can be implemented using remote human tasks. This variant has been referred to as constellation 4 in Figure 1. The remote human task is invoked using a mechanism similar to the BPEL invoke activity: Partner link and operation identify the human task based Web service to be called. In addition to that, the name of a response operation on the myRole of the partner link is specified, allowing the human task based Web service to provide its result back to the calling business process. Constellation 4 allows interoperability between BPEL4People compliant business processes of one vendor, and WS-HumanTask compliant human tasks of another vendor. For example, the communication to propagate state changes between the business process and the remote human task happens in a standardized way, as described in section 6 “Coordinating Standalone Human Tasks”. The remote human task can also define a priority element and people assignments. The priority and people assignments specified here override the original priority of the human task. The attribute responseOperation (of type xsd:NCName) specifies the name of the operation to be used to receive the response message from the remote human task. The operation attribute refers to an operation of the myRole port type of the partner link associated with the <b4p:remoteTask>. The attribute MUST be set in the BPEL4People Definition when the operation attribute refers to a WSDL one-way operation. The attribute MUST NOT be set when the operation attribute refers to a WSDL request-response operation. A WS-HumanTask Processor MUST send a response message back to its calling process. The endpoint to which the response is to be returned to typically becomes known as late as when the human task is instantiated. This is no problem in case the human task is invoked synchronously via a request-response operation: a corresponding session between the calling process and the human task will exist and the response message of the human task uses this session. But if the human task is called asynchronously via a one-way operation, such a session does not exist when the response message is sent. In this case, the BPEL4People Processor MUST pass the endpoint reference of the port expecting the response message of the human task to the WS-HumanTask Processor hosting the human task. Conceptually, this endpoint reference overrides any deployment settings for the human task. Besides the address of this port that endpoint reference MUST also specify additional metadata such that the port receiving the response is able to understand that the incoming message is in fact the response for an outstanding request (see [WS-HumanTask] section 8.2 for the definition of the metadata). Finally, such an endpoint reference MUST specify identifying data to allow the response message to be targeted to the correct instance of the calling process. The additional metadata MAY consist of the name of the port type of the port as well as binding information about how to reach the port (see [WS-Addr-Core]) in order to support the replying activity of the human task to send its response to the port. In addition, the name of the receiving operation at the calling process side is REQUIRED. This name MUST be provided as value of the responseOperation attribute of the <b4p:remoteTask> element (discussed in the previous section) and is passed together with an appropriate endpoint reference. The above metadata represents the most generic solution allowing the response to be returned in all situations supported by WSDL. A simpler solution is supported in the case of the interaction between the calling process and the human task being based on SOAP: In this case, the metadata of the endpoint reference simply contains the value of the action header to be set in the response message. In both cases (a request-response <b4p:remoteTask> as well as a <b4p:remoteTask> using two one-ways) the <b4p:remoteTask> activity is blocking. That is, the normal processing of a <b4p:remoteTask> activity does not end until a response message or fault message has been received from the human task. If the human task experiences a non-recoverable error, the WS-HumanTask Processor will signal that to the BPEL4People Processor and an b4p:nonRecoverableError fault MUST be raised in the parent process. As described in the previous section, people activities can also be implemented using remote notifications. This variant is also referred to as constellation 4. Using remote notifications is very similar to using remote human tasks. Except for the name of the element enclosed in the people activity the main difference is that the remote notification is one-way by nature, and thus does not allow the specification of a response operation. Remote notifications, like remote human tasks allow specifying properties that override the original properties of the notification Web service. The mechanism used is the same as described above. Like remote human tasks, remote notifications also allow overriding both people assignments and priority. DeferActivation: Specifies the activation time of the task. It is defined as either the period of time after which the task reaches state Ready (in case of explicit claim) or state Reserved (in case of implicit claim), or the point in time when the task reaches state Ready or state Reserved. The default value is zero, i.e. the task is immediately activated. If the activation time is defined as a point in time and the task is created after that point in time then the BPEL4People Processor MUST activate the task immediately. Expiration: Specifies the expiration time of the task when the task becomes obsolete. It is defined as either the period of time after which the task expires or the point in time when the task expires. The time starts to be measured when the task enters state Created. If the task does not reach one of the final states (Completed, Failed, Error, Exited, Obsolete) by the expiration time the BPEL4People Processor MUST change the task state to Exited. Additional user-defined actions MUST NOT be performed. The default value is infinity, i.e. the task never expires. If the expiration time is defined as a point in time and the task is created after that point in time the BPEL4People Processor MUST change the task state to Exited. Note that deferred activation does not impact expiration. Therefore the task MAY expire even before being activated. Element <b4p:scheduledActions> is used to include the definition of all scheduled actions within the task definition. If present, at least one scheduled activity MUST be defined in the BPEL4People Definition. b4p:for: The element is an expression which specifies the period of time (duration) after which the task reaches state Ready (in case of explicit claim) or state Reserved (in case of implicit claim).The absolute time of this transition is computed by adding the specified duration to the time at which the people activity begins execution. b4p:until: The element is an expression which specifies the point in time when the task reaches state Ready or state Reserved. Elements <b4p:for> and <b4p:until> are mutually exclusive. There MUST be at least one <b4p:for> or <b4p:until> element. b4p:for: The element is an expression which specifies the period of time (duration) after which the task expires. The absolute time of the expiration is computed by adding the duration to the time at which the people activity begins execution. b4p:until: The element is an expression which specifies the point in time when the task expires. The language used in expressions is specified using the expressionLanguage attribute. This attribute is optional. If not specified, the default language as inherited from the closest enclosing element that specifies the attribute is used. If specified, the scheduledActions element MUST NOT be empty, that is one of the elements b4p:deferActivation and b4p:expiration MUST be defined. Figure 2 shows the different states of the people activity and state transitions with associated triggers (events and conditions) and actions to be performed when transitions take place. When the process execution instantiates a people activity this activity triggers the creation of a task in state Running. Upon receiving a response from the task, the people activity completes successfully and its state changes into the final state Completed. If the task returns a fault, the people activity completes unsuccessfully and moves to final state Failed and the fault is thrown in the scope enclosing the people activity. If the task experiences a non-recoverable error, the people activity completes unsuccessfully and the standard fault nonRecoverableError is thrown in the enclosing scope. The people activity goes to final state Obsolete if the task is skipped. If the termination of the enclosed scope is triggered while the people activity is still running, the people activity is terminated prematurely and the associated running task is exited. A response for a terminated people activity MUST be ignored by the BPEL4People Processor. If the task expires, the people activity is terminated prematurely and the associated task exits. In this case the standard fault b4p:taskExpired is thrown in the enclosing scope. When the process exits the people activity will also be terminated and the associated task is exited. As defined by [WS-HumanTask], task instance data falls into the categories presentation data, context data, and operational data. Human tasks defined as part of a BPEL4People compliant business process have a superset of the instance data defined in [WS-HumanTask]. The presentation data of tasks defined as part of a BPEL4People compliant business process is equivalent to that of a standalone human task. The operational data of tasks that is defined as part of a BPEL4People compliant business process is equivalent to that of a standalone human task. This section introduces XPath extension functions that are provided to be used within the definition of a BPEL4People business process to access process context. Definition of these XPath extension functions is provided in the table below. Input parameters that specify peopleActivity name MUST be literal strings. This restriction does not apply to other parameters. Because XPath 1.0 functions do not support returning faults, an empty node set is returned in the event of an error. Returns the stakeholders of the process. It MUST return an empty htt:organizationalEntity in case of an error. Returns the business administrators of the process. It MUST return an empty htt:organizationalEntity in case of an error. Returns the initiator of the process. It MUST return an empty htt:tUser in case of an error. Returns the value of a logical people group. It MUST return an empty htt:organizationalEntity in case of an error. Returns the actual owner of the task associated with the people activity. It MUST return an empty htt:tUser in case of an error. Returns the initiator of the task. Evaluates to an empty htt:user in case there is no initiator. It MUST return an empty htt:tUser in case of an error. Returns the stakeholders of the task. It MUST evaluate to an empty htt:organizationalEntity in case of an error. Returns the potential owners of the task associated with the people activity. It MUST return an empty htt:organizationalEntity in case of an error. Returns the administrators of the task associated with the people activity. It MUST return an empty htt:organizationalEntity in case of an error. Returns the priority of the task associated with the people activity. It MUST evaluate to "5" in case the priority is not explicitly set. the task outcome (xsd:string)- if the outcome is not present, the empty nodeset MUST be returned. XPath functions accessing data of a human task only guarantee to return data once the corresponding task has reached a final state. Using the WS-HT coordination protocol introduced by [WS-HumanTask] (see section 7 “Interoperable Protocol for Advanced Interaction with Human Tasks” for more details) to control the autonomy and life cycle of human tasks, a BPEL process with a people activity can act as the parent application for remote human tasks. Figure 3 shows some message exchanges between a BPEL process containing a people activity to perform a task (e.g. risk assessment) implemented by a remote human. The behavior of the people activity is the same as for a people activity with an inline human task. That behavior is achieved by coordinating the remote human task via the WS-HT coordination protocol. The BPEL4People Processor people activity MUST support the following behavior and the protocol messages exchanged with a standalone task. A summary is provided in the table below. When the process execution reaches a people activity and determines that this activity can be executed, the BPEL4People Processor MUST create a WS-HT coordination context associated with the activity. This context is sent together with the request message to the appropriate service associated with the task. In addition, overriding attributes from the people activity, namely priority, people assignments, the skipable indicator and the task’s expiration time, are sent. Also the BPEL4People Processor MAY propagate ad-hoc attachments from the process. All this information is sent as part of the header fields of the requesting message. These header fields as well as a corresponding mapping to SOAP headers are discussed in [WS-HumanTask]. When a response message is received from the task that indicates the successful completion of the task, the people activity completes. This response MAY include all new ad-hoc attachments from the human task. When a response message is received from the task that indicates a fault of the task, the people activity faults. The fault MUST be thrown in the scope of the people activity. When protocol message fault is received, the fault nonRecoverableError MUST be thrown in the scope enclosing the people activity. When protocol message skipped is received, the people activity MUST move to state Obsolete. If the task does not reach one of the final states by the expiration deadline, the people activity MUST be terminated. Protocol message exit is sent to the task. When the people activity is terminated, protocol message exit MUST be sent to the task. When the process encounters an <exit> activity, protocol message exit MUST be sent to the task. The following table summarizes this behavior, the protocol messages sent, and their direction, i.e., whether a message is sent from the people activity to the task (“out” in the column titled Direction) or vice versa (“in”). BPEL abstract processes are indicated by the namespace "http://docs.oasis-open.org/wsbpel/2.0/process/abstract". All constructs defined in BPEL4People extension namespaces MAY appear in abstract processes. Opaque tokens defined in BPEL (activities, expressions, attributes and from-specs) MAY be used in BPEL4People extension constructs. The syntactic validity constraints of BPEL MUST apply in the same way to an Executable Completion of an abstract process containing BPEL4People extensions. BPEL4people does not change the way opaque activities can be replaced by an executable activity in an executable completion of an abstract process, that is, an <abstract:opaqueActivity> MAY also serve as a placeholder for a <bpel:extensionActivity> containing a <b4p:peopleActivity>. Any attribute introduced by BPEL4People MAY have an opaque value "##opaque" in an abstract process. In BPEL, any from-spec in an executable process can be replaced by an opaque from-spec <opaqueFrom/> in an abstract process. This already includes any BPEL from-spec extended with the BPEL4People b4p:logicalPeopleGroup="NCName" attribute. In addition, the extension from-spec <htd:from> MAY also be replaced by an opaque from-spec in an abstract process. In BPEL, omittable tokens are all attributes, activities, expressions and from-specs which are both (1) syntactically required by the Executable BPEL XML Schema, and (2) have no default value. This rule also applies to BPEL4People extensions in abstract processes. For example, <b4p:localTask reference="##opaque"> is equivalent to <b4p:localTask>. The Abstract Process Profile for Observable Behavior, indicated by the process attribute abstractProcessProfile="http://docs.oasis-open.org/wsbpel/2.0/process/abstract/ap11/2006/08", provides a means to create precise and predictable descriptions of observable behavior of the service(s) provided by an executable process. The main application of this profile is the definition of business process contracts; that is, the behavior followed by one business partner in the context of Web services exchanges. A valid completion has to follow the same interactions as the abstract process, with the partners that are specified by the abstract process. The executable process can, however, perform additional interaction steps relating to other partners. Likewise, the executable process can perform additional human interactions. Beyond the restrictions defined in WS-BPEL 2.0, the use of opacity is not restricted in any way for elements and attributes introduced by BPEL4People. The Abstract Process Profile for Templates, indicated by the process attribute abstractProcessProfile="http://docs.oasis-open.org/wsbpel/2.0/process/abstract/simple-template/2006/08", allows the definition of Abstract Processes which hide almost any arbitrary execution details and have explicit opaque extension points for adding behavior. This profile does not allow the use of omission shortcuts but the use of opacity is not restricted in any way. For abstract processes belonging to this profile, this rule is extended to the elements and attributes introduced by BPEL4People. The XML schema pointed to by the RDDL document at the namespace URI, defined by this specification, are considered to be authoritative and take precedence over the XML schema defined in the appendix of this document. There are four conformance targets defined as part of this specification: a BPEL4People Definition, a BPEL4People Processor, a WS-HumanTask Definition and a WS-HumanTask Processor (see section 2.3). In order to claim conformance with BPEL4People 1.1, the conformance targets MUST comply with all normative statements in the BPEL4People and the WS-HumanTask specification, notably all MUST statements have to be implemented. The following list specifies the standard faults defined within the BPEL4People specification. All standard fault names are qualified with the standard BPEL4People namespace. Thrown if the task experiences a non-recoverable error. Thrown if the task expired. Portability - The ability to take design-time artifacts created in one vendor's environment and use them in another vendor's environment. Constellations one and two provide portability of BPEL4People processes with embedded human interactions in. Constellations three and four provide portability of BPEL4People processes with referenced human interactions. Interoperability - The capability for multiple components (process engine, task engine and task list client) to interact using well-defined messages and protocols. This enables to combine components from different vendors allowing seamless execution. Constellation four achieves interoperability between process and tasks from different vendor implementations. Task definitions are defined inline of the people activities. Usage in this manner is typically for self-contained people activities, whose tasks definitions are not intended to be reused elsewhere in the process or across multiple processes. This format will also provide scoping of the task definition since it will not be visible or accessible outside the people activity in which it is contained. Portability for this constellation requires support of both WS-HumanTask and BPEL4People artifacts using the inline task definition format. Since the process and task interactions are combined in one component, interoperability requirements are limited to those between the task list client and the infrastructure. Similar to constellation 1, but tasks are defined at the process level. This allows task definitions to be referenced from within people activities enabling task reuse. Portability for this constellation requires support of both WS-HumanTask and BPEL4People artifacts using the process level scoped task definition format. Since the process and task interactions are combined in one component, interoperability requirements are limited to those between the task list client and the infrastructure. In this constellation, the task and people activity definitions are defined as separate artifacts and execute in different infrastructure components but provided by the same vendor. Portability for this constellation requires support of both WS-HumanTask and BPEL4People as separate artifacts. Since the process and task components are implemented by the same vendor, interoperability requirements are limited to those between the task list client and the infrastructure. Identical to constellation 3 in terms of the task and people activity definitions, but in this case the process and task infrastructure are provided by different vendors. Portability for this constellation requires support of both WS-HumanTask and BPEL4People as separate artifacts. Interoperability between task and process infrastructures from different vendors is achieved using the WS-HumanTask coordination protocol. Copyright (c) OASIS Open 2009. All Rights Reserved. The process is started and as a first step, the people are determined that qualify as voters for the “Employee of the month”. Next, all the voters identified before get a chance to cast their votes. After that, the election result is determined by counting the votes casted. After the result is clear, two different people from the set of people entitled to approve the election either accept or reject the voting result. In case any of the two rejects, then there is no “Employee of the month” elected in the given month, and the process ends. In case all approvals are obtained successfully, the employees are notified about the outcome of the election, and a to-do is created for the elected “Employee of the month” to prepare an inaugural speech. Once this is completed, the process completes successfully. 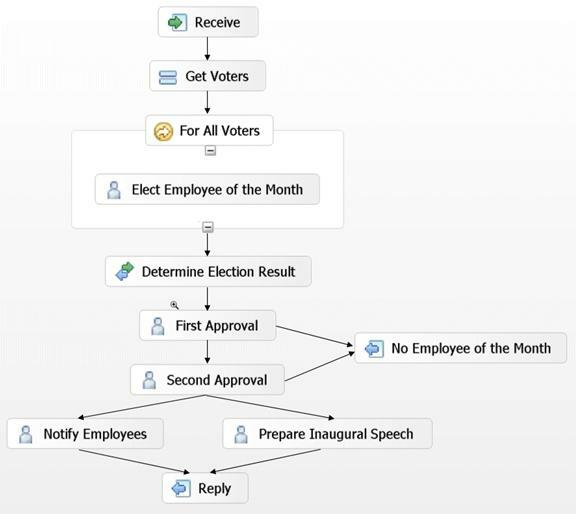 The sections below show the definition of the BPEL process implementing the “Employee of the month” process. month for the given region. employee of the month election for the given region. election of the employee of the month. Mike Amend, BEA Systems, Inc.
Justin Brunt, TIBCO Software Inc.
Alireza Farhoush, TIBCO Software Inc.
Mark Ford, Active Endpoints, Inc.
Michael Pellegrini, Active Endpoints, Inc.
Michael Rowley, BEA Systems, Inc. In addition, the following individuals have provided valuable input into the design of this specification: Dave Ings, Diane Jordan, Mohan Kamath, Ulrich Keil, Matthias Kruse, Kurt Lind, Jeff Mischkinsky, Bhagat Nainani, Michael Pellegrini, Lars Rueter, Frank Ryan, David Shaffer, Will Stallard, Cyrille Waguet, Franz Weber, and Eric Wittmann. Resolution for Issue #18 applied to sections 4.6.2 and 5; Typos correction. Resolution for Issue #2 applied in section 4.7, and for issue #19 in sections 4.3.1 and 4.4.1.